During what head coach Rich Rodriguez termed an “awful year” the Arizona Wildcats have struggled on both sides of the football, ranking 75th and 113th in total offense and defense, respectively. While injuries at the quarterback position and a lack of continuity across the team have contributed to the team’s dismal 2-9 record through 11 games, there have been a few impressive aspects of this team. On offense specifically, the Wildcats have looked incredibly well-prepared and well-coached all season to attack zone coverage when the quarterback moves outside the pocket. On both designed bootlegs and improvised scrambles the receivers have been able to flow with the play and settle in the soft spots in zones to turn nothing into something. Credit should be given to the receivers for reading defenses so well, but also to the offensive coaching staff for preparing the receivers each week on where the seam in the coverage will be when defenders adjust for a moving quarterback. 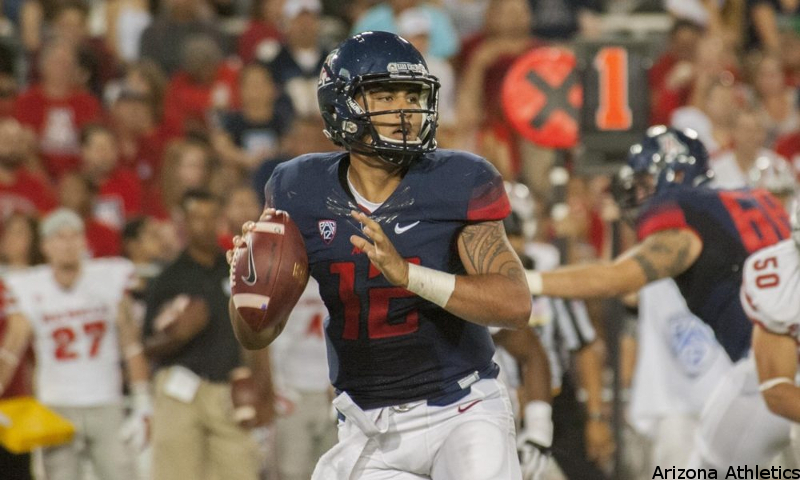 If the Arizona offense can keep attacking zone coverages and rely on the continued development of quarterbacks Anu Solomon and Brandon Dawkins, 2017 could be a major step forward for the Wildcats program. 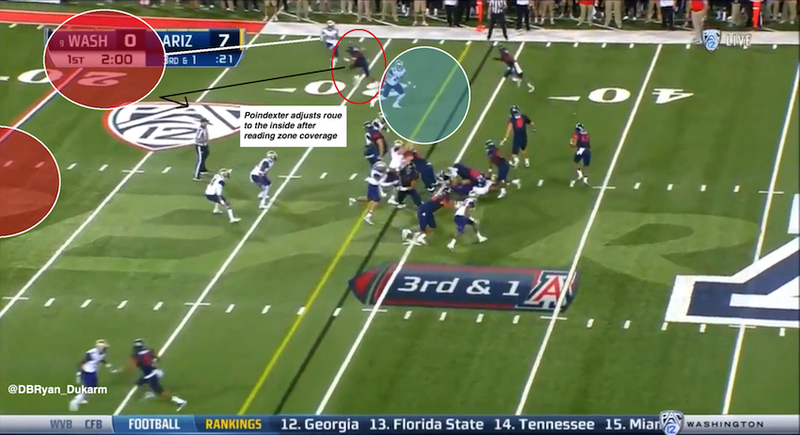 The first example of the Wildcats attacking zone coverage from a designed QB rollout comes from their game against BYU. With 10:01 remaining in the second quarter and facing a 2nd and 5, the Wildcats have 10 personnel in a gun right trips right formation. BYU counters with a 2-5-4 base defensive personnel look. 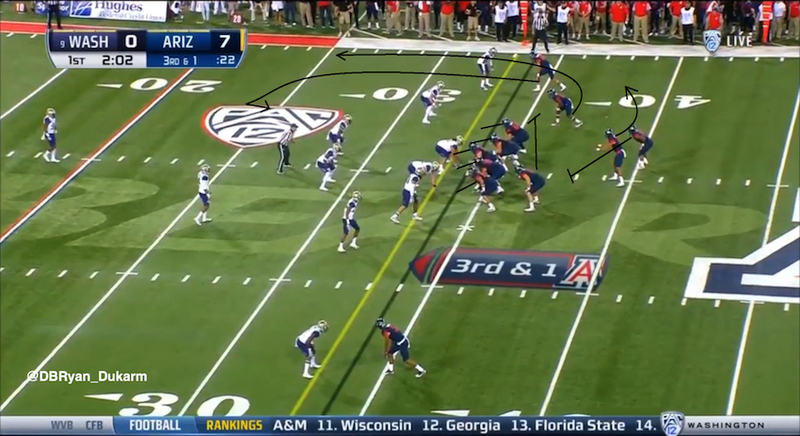 Arizona runs a double hooks concept with a built in bubble screen to the trips side. Solomon (#12) fakes a handoff to the running back before rolling to his right. BYU drops into a Cover 3 zone at the snap. Once the play begins, outside receiver Trey Griffey (#5) and middle receiver Nate Phillips (#11) run hook routes at depths of 12 and 10 yards, respectively. Solomon rolls to his right, keeping his eyes on Griffey the whole way. As Solomon eyes Griffey, underneath linebacker Fred Warner (#4) follows the QB’s eyes and shifts very slightly outside to cut off the throw to Griffey. Phillips, who reads the shift by Warner, begins sliding back to the middle of the field to open a throwing lane in the seam of the zone. 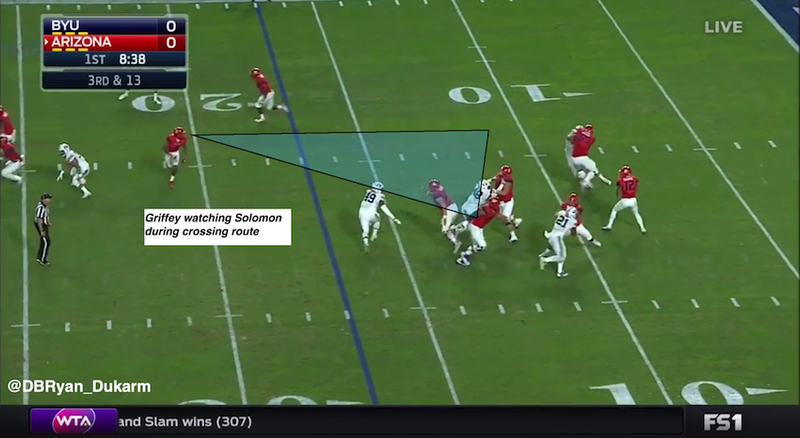 Solomon correctly reads the shift from the linebacker and the corresponding adjustment from Phillips. He makes a quick decision and throw to hit Phillips for a gain of 15 yards. The subtlety displayed on this play is very impressive. 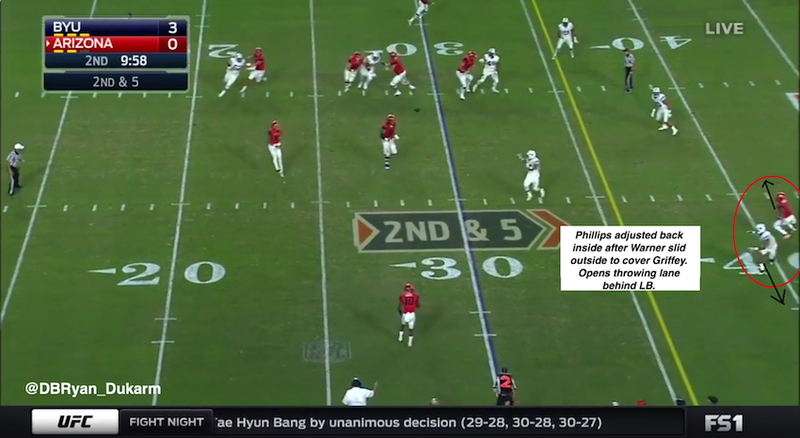 The adjustment from Phillips to know where the weakness in BYU’s Cover 3 would be created an opening for Solomon. 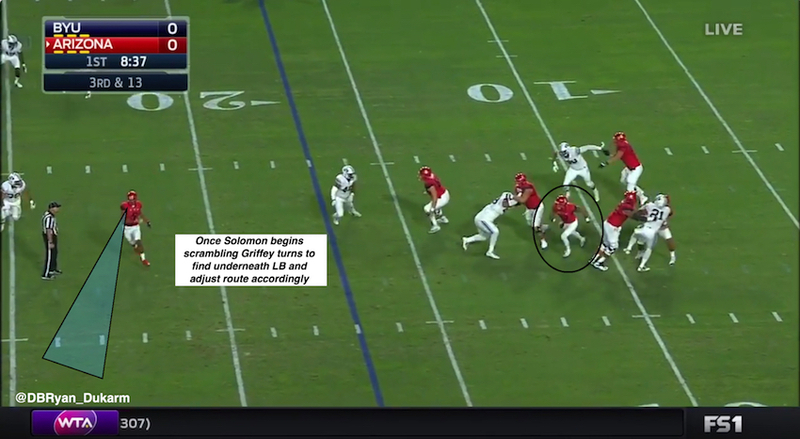 Additionally, Solomon did a great job working off his first read after reading the linebacker to come back inside and hit Phillips for the first down. 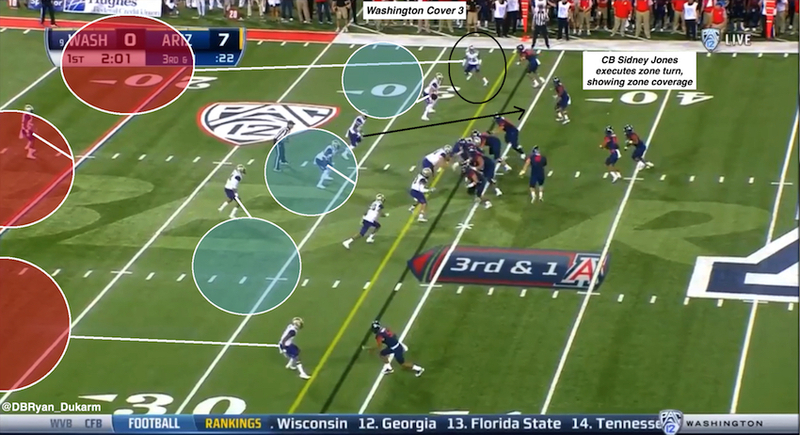 Another example can be found in the first quarter of Arizona’s game against the Washington Huskies. With 2:02 remaining in the quarter, Arizona faces a 3rd and 1 at the Washington 34-yard line. The Wildcats deploy 11 personnel with a wing back and split receiver to the left, a slot formation to the right, and Dawkins (#13) in the shotgun. 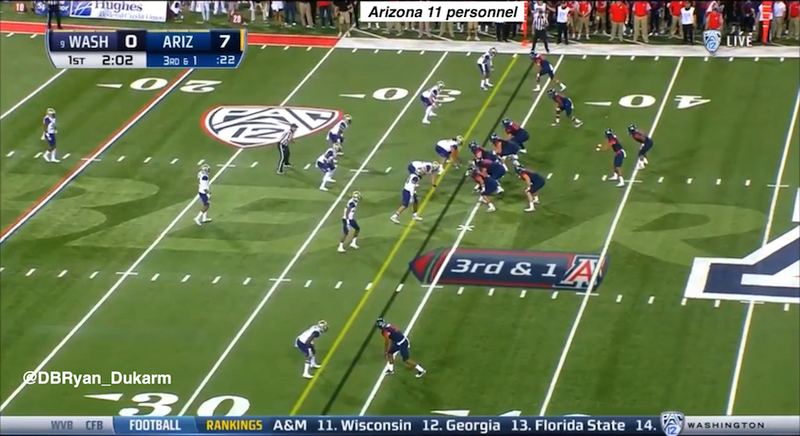 Arizona rolls Dawkins to the right of the formation after faking a split zone play up front. The offensive line zone blocks to the left, while wingback Trevor Wood (#8) comes back across the formation. Dawkins fakes a handoff and rolls to the right, using Wood as a lead blocker to set up to pass. Outside receiver Shawn Poindexter (#80) runs a hook route at a depth of 9 yards, while the slot receiver runs a wheel route. Poindexter makes a great read right from the beginning of the play, as he sees Washington cornerback Sidney Jones (#26) execute a zone turn by opening his hips at the snap, signalling to Poindexter that the Wildcats are facing zone coverage. Because Jones will be held along the sideline as a deep third defender in Washington’s Cover 3 zone by the slot receiver’s wheel route, Poindexter adjusts his route to the inside, settling behind the underneath defender and in between Jones and middle third safety Budda Baker (#32). Dawkins settles after rolling out and zips the ball to Poindexter before Baker or Jones can cover him for a gain of 13 yards. One important trait when evaluating wide receivers is the ability to continue their route once the play breaks down and the QB scrambles out of the pocket. Receivers who can improvise and flow with the play to open areas of the field help offenses thrive and are key elements of a passing game with mobile QBs. 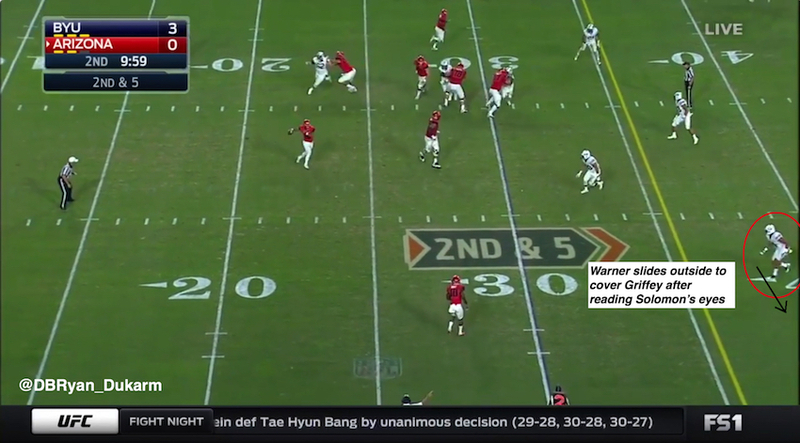 This ability to flow with a QB on the move is a key part of the Arizona offense, as both Solomon and Dawkins are good athletes who can thrive outside of structure. In the below example from their game against BYU, the Wildcats display the ability to thrive on offense when the protection breaks down and the QB moves out of the pocket. Facing 3rd and 13 with 8:40 remaining in the first quarter, the Wildcats have 10 personnel, with three receivers clustered tight to the offensive line on the right and Solomon in the shotgun. 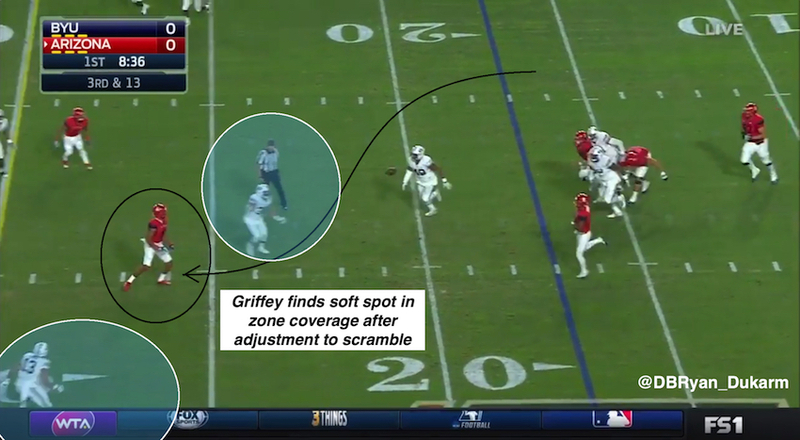 Griffey is the key route on this play, as he runs a shallow cross over the middle of the field from the outermost receiver position on the right. 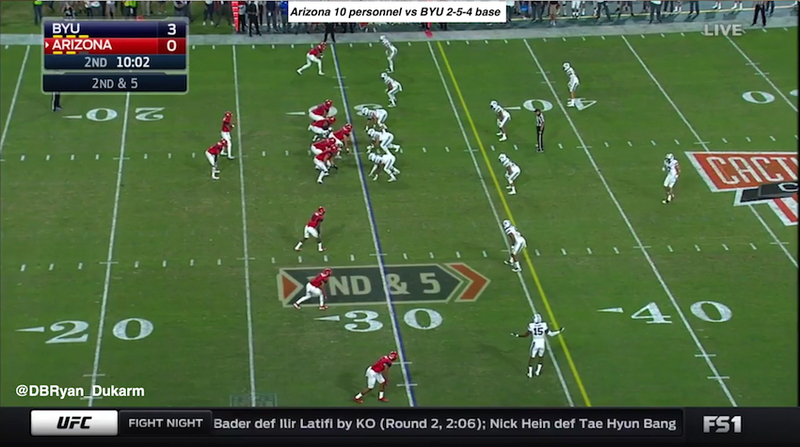 BYU runs Cover 3 on this play, keeping four defenders underneath. 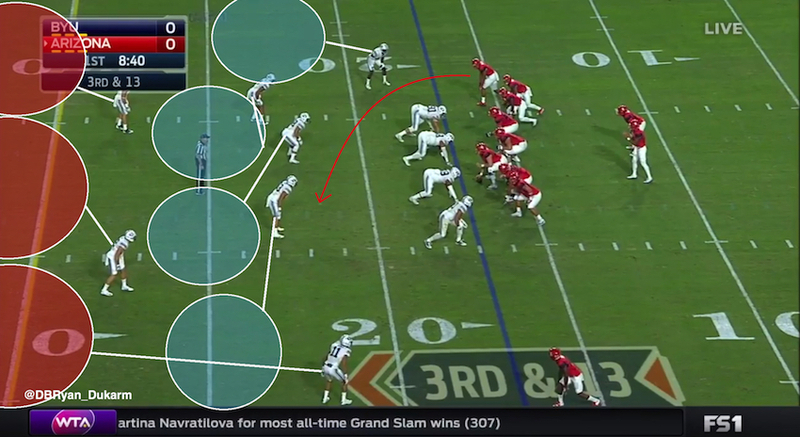 Once the play begins, Griffey runs his drag route at a depth of about 5 yards. 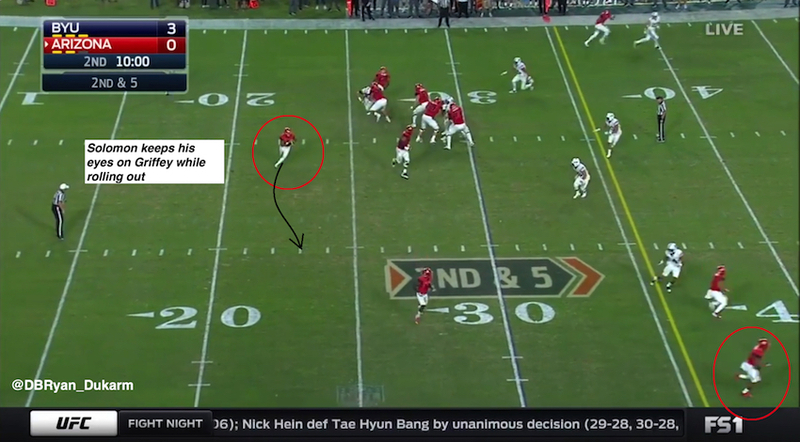 As he runs across the field his eyes are fixed in the backfield on Solomon, looking for the ball. However, once he sees Solomon begin running forward through the pocket and scrambling he turns in front of him, identifying where underneath linebacker Francis Bernard (#13) is. He adjusts his route, sliding up the field between Bernard and Butch Pau’u (#38) to gain more yards after the catch. Solomon sees the adjustment, floats the ball over the outstretched hands of Pau’u, and hits Griffey en route to a 32-yard gain. This route adjustment from Griffey is an absolute thing of beauty, as he quickly and efficiently identifies zone coverage and adjusts his route on third down to find the soft spot in the underneath coverages. Credit should also be given to Solomon who didn’t tuck the ball and run after scrambling, but kept his eyes up and found Griffey sneaking behind the coverage. Arizona may not have the strongest team this season, but since injuries and youth have largely derailed their chances of succeeding in 2016, it’s clear that this is a well-coached and smart team on the field going forward. Follow Ryan on Twitter @DBRyan_Dukarm. 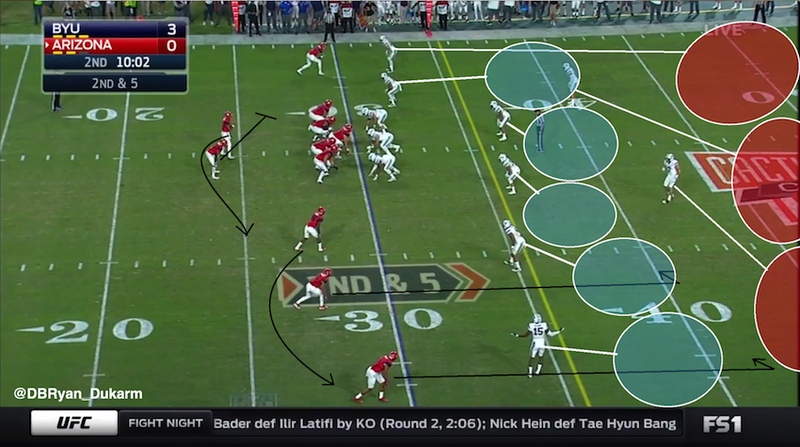 Check out the rest of his work, including covering the UCLA Bruins’ use of Spot Concept, the Pittsburgh Steelers’ end around rush, and Buffalo’s double track block scheme and deep passing game. All media courtesy of the Pac-12 Network and FS1.